Ideea ca toti cei care au luptat in decembrie 1989, habar n-aveau despre arme si n-au stiut impotriva cui au luptat este o iluzie. Sorin Babii (n. 14 noiembrie 1963, Arad) este un trăgător de tir român, laureat cu aur la Seul 1988 și cu bronz Barcelona 1992. A reprezentat România la 6 ediții ale Jocurilor Olimpice. From every revolution blossom legendary moments. Paul Revere’s ride. Marie Antoinette’s beheading. A lone Chinese man blocking the path of a Red Army tank in Tien An Men Square. Situations are magnified when performed in the theater of change. But sometimes, in this chaotic environment, circumstances become muddled and legends exaggerated. Last December, the world was entranced by an unfolding drama on the streets of Bucharest, Romania. Previously faceless citizens were voicing opposition to the repressive rule of dictator Nicolae Ceausescu. In contrast to nearby Czechoslovakia, where the downfall of the Communist Party was accomplished peacefully, Ceausescu was being uprooted by force. Daily televised reports showed mobs in Bucharest’s Palace Square chanting slogans and opposing the Securitat, the dictator’s private army that controlled the country through intimidation. In 11 days of bloodshed, many riveting stories were reported. But perhaps none was as captivating as those about Romanian Olympic pistol shooters Ion Corneliu and Sorin Babii, who reportedly volunteered to flush out Communist forces and defend a military target. Now, though, Corneliu, Romania’s three-time Olympian in pistol competition, says such reports were exaggerated. 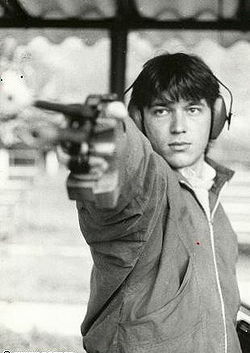 “It’s just not true,” he said last week at the 1990 World Cup USA tournament at Petersen’s Prado Tiro Ranges in Chino. Corneliu, 39, one of six Romanians on an international tour, downplayed his role in last winter’s fighting. He and Tiron Costica, the national team trainer, spoke about the revolution and its legacy with the help of U.S. national pistol coach, Dan Iuga, a Romanian who defected seven years ago. Corneliu, a major, won a gold medal at the Moscow Olympics and a silver at Los Angeles. Partially because of these performances, he recently was named president of the Romanian Shooting Federation. During the 11 days that shook Romania, Corneliu had more important concerns than target practice at his military club in the Ghencea neighborhood of northeast Bucharest. Corneliu said the national shooting team missed the major battles because it was stationed outside the city center. He said that although most of the shooters were military club personnel, they were considered soldiers once the rapid-fire events began. That was a few days before the actual fighting, Corneliu said. When it was apparent that independent movements from cities such as Timisoara were spreading throughout the country, army leaders were told to suppress the activists. Commanders, however, emerged as a pivotal opposition force, and earned enormous prestige. “When the time came for Ceausescu to leave, we received orders to defend our position against anybody who would try to attack,” Corneliu said. “We suddenly became part of the revolution. “It was very lucky that the army was ordered not to move. If we had received an order to fight against the revolution it would have been a blood bath. In an effort to thwart revolutionaries, Securitat forces tried to overtake strategic points around Bucharest, including television, radio and telephone communication centers, the airport and Corneliu’s base. Corneliu said Ceausescu’s forces wanted access to the base’s gunnery. “They would shoot in our direction and we would answer,” he said. “But we didn’t know who was there or where they were. The loyalist sharpshooters were equipped with infrared telescopic sights and were able to pick off Romania’s revolutionary soldiers at night, the Soviet news agency Tass reported last December. Whereas Corneliu and other Romanian national shooters were isolated in their fortress, Costica was among the thousands in Palace Square demanding Ceausescu’s ouster after 24 years of control. Costica said the gripping, spontaneous scenes will stay with him forever. Some of the poignant moments downtown occurred when armored trucks and tanks crushed people who tried to block their way. Corneliu said his brother, a doctor who worked in a hospital emergency room, treated some of those victims. After a month’s traveling, the Romanians looked a bit weary but understood the importance of talking publicly about their country’s plight. Western curiosity has generated an endless stream of questions. Four months ago, they would have been uncomfortable discussing the East European political landscape in the United States. “(Before), when we left the country we couldn’t say anything,” Costica said. “We could never tell people that we didn’t believe in the Communist system but only played along because it was the only way to participate in what you wanted to do. So now they talk. And they dream. The political and economic realities have replaced the giddiness of those heady days just after Ceausescu and his family were executed. To the west, there is the Hungarian question in Transylvania. The Romanians do not want the minority population there to join neighboring Hungary. To the east there is the Moldavian question in the Soviet Union. The Romanians want to reunite with the Soviet republic. A secret pact by Hitler in 1939 allowed Moldavia’s annexation by the USSR. Corneliu said he cannot predict the outcome of these pressing issues. But revolutionary hero or not, he is proud to have played a role in determining Romania’s future. They brought me to Colentina Hospital and there I had the great fortune of two great doctors. If they had operated on me, they would have to amputate both my legs beneath the knee, but instead they left the bullets in there 12 days. Their explanation was that the bullets were too close to arteries, and since they were gloante crestate (notched bullets), it was very dangerous. After they were removed, I kept the bullets, I have them at home. I was on crutches for six months, I went through therapy, but I had to give up soccer. “A invatat sa zambeasca, [He learned how to smile],” http://marianmanescu.wordpress.com/2007/12/21/a-invatat-sa-zambeasca. Astept si acum raspuns la intrebarile mele…poate ca totusi cineva se vagasi sa rupa tacerea…II multumesc anticipat !